The base of this page is more of the Blue Fern Studios Tranquility collection - the Patience sheet, with the colors that match the colors of the sky and the sea. I've created a background to match the water using the Ranger Distress Grit Paste from the August Mediums add-on and the Stain stencil from Prima. Also from the Mediums is the Blue Fern Studios Embossing Powder in Mushroom that I used to treat the BFS chipboard Layering Stems that came in the Main Kit. From my stash, I've used corrugated packaging in the background and cheesecloth and sea shells on the bottom of my photo. The pearl strands are from the Embellishment add-on; the bit of Jillibean Soup Wordfetti is from an earlier kit. Vincent is part fish; he's loved the water since infancy. He had a ball in the ocean, enjoying the waves and splashes. Hi Peggy! 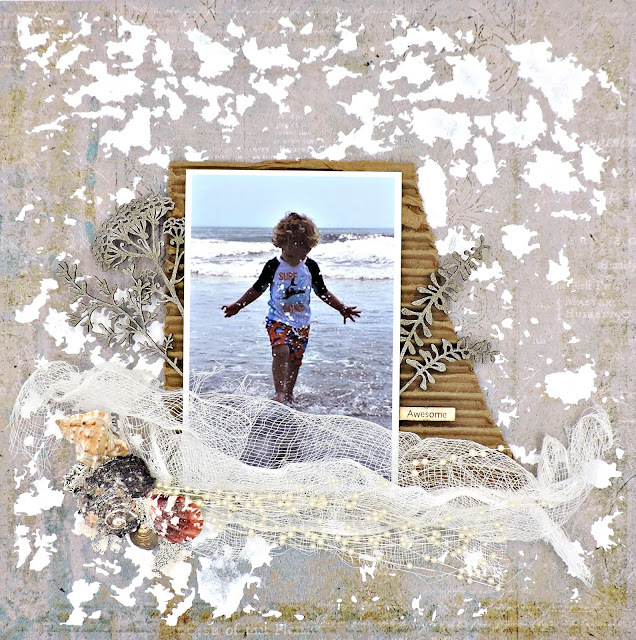 I saw this on scrapbook.com and just had to stop by your blog to see it more closely! I absolutely LOVE your gorgeous page and all of the wonderful beachy details!